Oftentimes during a year of stress, some Blue Oaks shut down, loose their leaves, only to come back to life the following season. But our 4-year drought was too much and too long for whole slopes of oaks, despite above-average rainfall this season. Now, as the survivors begin to leaf-out, the casualties are fairly easy to distinguish. Most, it seems, are below 2,000 feet in elevation on north to west-facing hillsides. As these trees have been here all my life, I’m guessing they are over 100 years old, but most have probably been here less than 200 years. Usually at the top of these slopes is an older tree, or remnants of an older tree, a grandfather oak that provided the acorns. 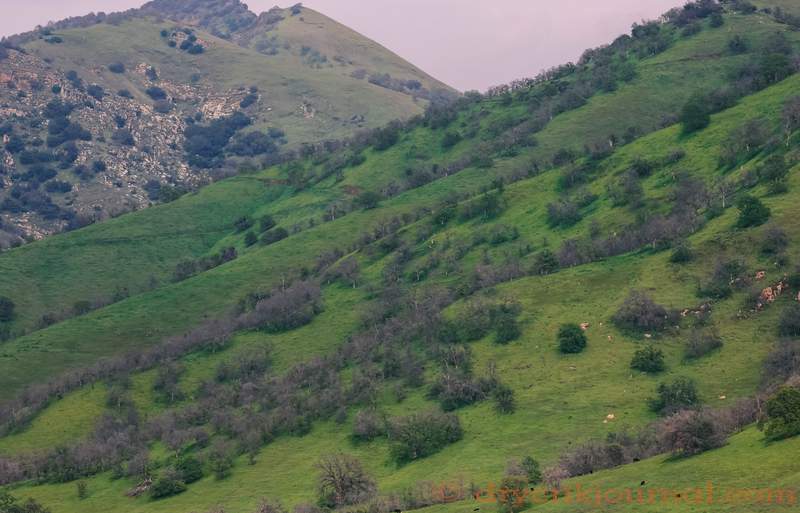 This entry was posted in Photographs, Ranch Journal and tagged Blue Oak, Drought, photography. Bookmark the permalink. Perhaps we’ll see some new life spring forth from a few of the acorns that remained hidden like Easter Eggs from the critters. The old will fall to nourish the new. It will be interesting, many established before cattle grazing, a staple for native people and wildlife. Unfortunately, you and I won’t be around long enough to learn much. It’s a new chapter.